Looking to get help on identifying this boat. 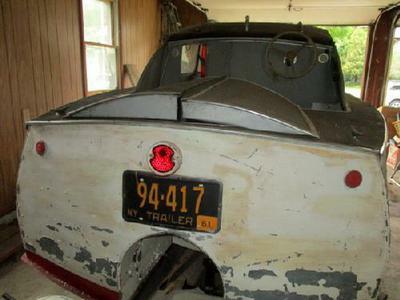 Not sure if it was a kit boat, custom boat or production boat....circa 1960, 1961 per previous owner. Wheel are attached to hull & has a hitch coupler attached to the bow (water line area)........so in a sense it's a boat & trailer in 1! Some Parts were from the Wilcox & crittenden catalog of the period. Cute little boat. (The "WC" in the center of the wheel stands for Wilcox Crittenden, a long standing manufacturer of marine hardware, nothing to do with who built her.). 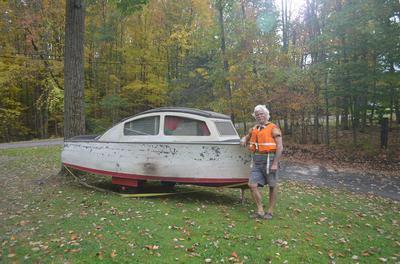 I bought this boat in east aurora ny on sept 22 2017 at auction. Boat has been stored , unused or moved in the same garage since 1961. Came with no paperwork. No builder identification or numbers on hull. A really interesting older mini cabin cruiser/boat that you don't see every day! We could not find any manufacturer's name on it. Roof is made of 2" oak strips spaced over steel ribs with a burlap type padding cover with a rubberized landau type top. It has small (6'W x8’Lx 4'H) cabin that is accessed through as folding door. Inside is a steel Fram bed with original mattress. The pair of wheels are retractable. When the boat is in the water you release a clasp, pull up on a cable and the wheel rise up inside a compartment inside the cabin. When fully up there is a clasp you turn to hold them in place. A the stern is a two door compartment to place the outboard motor in. Also included with the boat is a 48"l x 24"w x 34"h wood supply box. Inside there is a brand new "American LaFrance" Fire extinguisher. Rope, flares. 2 0 metal 5 gallon gas cans. 9 cans new/full "Texaco Outboard Motor Oil." Extra props - new. 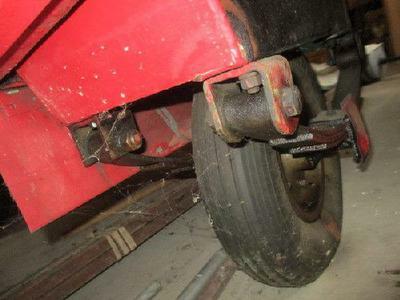 Spare tire(new). "Kooklite" two in one cooking lantern. Made of eight pieces of flotation cork wrapped in a bright orange canvas vest with six canvas ties. 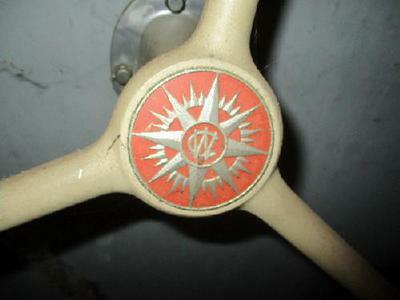 Typical of Life Vests found aboard Ocean Liner's.Made by "Atlantic Pacific Manufacturing Company, Brooklyn, New York." Vest contains four pieces of cork measuring 11"tall x 5"wide x 2"thick and four pieces of cork measuring 6 1/2"tall x 5"wide x 2"thick. Vest overall measures when opened, 44"long x 11"tall x 2"deep. - kooklite stove lantern is from 1953 or so. This boat has an outboard engine which is concealed in a closed (aft) compartment. Don't know what it is but best clue is the center emblem on the steering wheel.